Global Translation and Localization Agency in Northern Europe. Baltic Media Ltd. An ISO 9001:2015 Certified Scandinavian and Baltic Language Service Provider. Since 1991. Scandinavian Translation Services. What Do We Mean by the Quality? The following map shows how to say (or rather write) the equivalent of “Merry Christmas” in European languages. The colouring corresponds to etymological relations between the translations of the word Christmas (i.e. 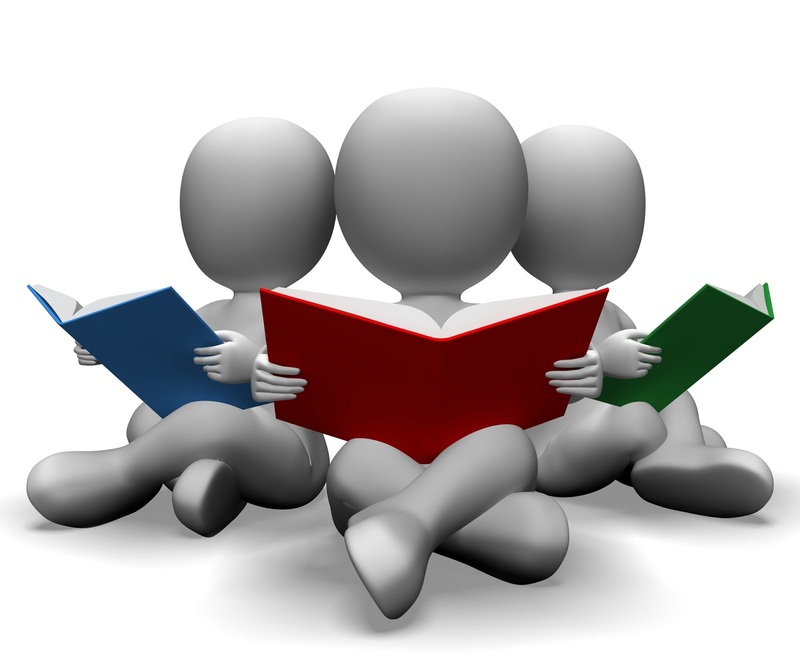 not to language families and not to relations between other parts of the phrase). This leads to a few unexpected results. Even though Romanian and Hungarian are completely unrelated languages, the words karácsony and Crăciun come from a common root (either Proto-Slavic *korčiti or Latin creātiōnem). The Irish, Welsh and Scottish Gaelic words are all borrowed from Romance languages and are related to French Noël. The same holds true for the Turkish expression, which is directly borrowed from French. Something quite unusual happens in Czech and Slovak. The word Vánoce resp. Vianoce is derived from German Weihnachten by retaining the “Weih” part (which comes from an old Germanic expression meaning “holy”) and replacing nachten (“nights”) by the Czech/Slovak translation, “noce”. However, the word “noce” itself comes from the same Proto-Indo-European root as German “Nachten” (and English “nights”), so the Czech/Slovak and German expressions are essentially etymologically equivalent. Learning a new language takes time. But according to US diplomatic training guides, there are many languages that Americans should be able to learn in under a year. 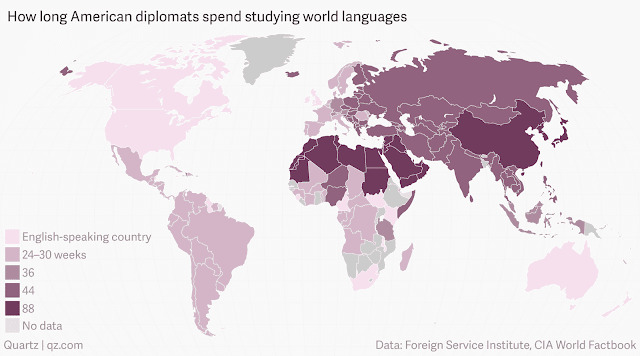 The map below shows how long it takes to learn almost 70 different languages, estimated by the Foreign Service Institute, which teaches these languages to would-be or current diplomats. Countries on the map are colored according to how much time it takes to learn the local language: The darker-colored the country, the longer it takes. The CIA Factbook was used to identify a dominant language for each country. Countries with no clear dominant language, like multilingual Mozambique, or where the FSI doesn’t teach the dominant language, appear gray. The numbers of weeks in that map represent the amount of time a learner with no experience of a language will need to get to “3/3 proficiency,” meaning a three out of five for speaking/reading. A zero, the FSI writes, indicates “only a cursory level knowledge of the language,” while five shows a “highly articulate, well-educated, native-speaker proficiency.” As of last year, there were over 4,200 staffers in the FSI with at least this 3/3 level of proficiency, in “about 70 languages,” according to a recent report(pdf). One thing to note here. These estimates, like 24 weeks for Spanish, assume the learner is in one of the FSI’s intensive courses. For the hardest languages, like Chinese, the course may even include several months of immersive study abroad. What’s more, the FSI sets out to hire smart, worldly people, and its estimates assume the student has “very good or better aptitude for classroom learning of foreign languages.” So the idea that it “takes 44 weeks to learn Finnish” is not very meaningful to most people. There is no absolute answer to which language is the “easiest” or “most difficult,” because every learner is different. A native English speaker will have a harder time learning Italian than a native Spanish speaker, since the two Romance languages are closely related. And some people find pronunciation in a tonal language like Vietnamese difficult, while others adapt easily. The FSI difficulty measurements are also a bit confusing based on the “speak/read” requirement. Mandarin grammar is not nearly as complicated as that of some European languages, but the complexity of the Chinese writing system puts it in the highest category. The map does show, though, a general trend of increasing the difficulty the farther American English-speakers get from the United States—starting with Europe and South America and continuing to Western Asia and East Asia—with obvious exceptions like Australia and the relative ease of Indonesian compared to Japanese or Chinese. The map also shows how much easier colonialism has made things for speakers of Western languages. SDL Trados Studio 2014 - How badly do we want it? About: All materials on this site are taken from open sources - have a link back to the material on the Internet or sent by visitors to the site and are provided for informational purposes only. Rights to the materials belong to their owners. Baltic Media Ltd . Simple theme. Theme images by mariusFM77. Powered by Blogger.